Hamburg 2018 English - iff - institut für finanzdienstleistungen e.V. Contact: Melanie Poldrack +49 40 309691 23, melanie.poldrack@iff-hamburg.de. Co-organizers: Consumer Agencies Baden-Württemberg, Bremen, Hamburg, Hessen, North Rhine – Westphalia, Saarland, Saxony and the Federation of German Consumer Organisations (vzbv), inkassowatch, Prevention Network Old Age Provision, AG SBV. Organisation of workshops for laywers: Dr. Olaf Methner (Baum, Reiter & Collegen). 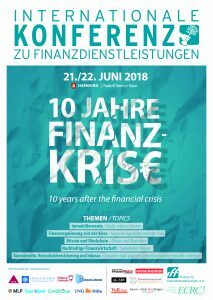 The 13th German Financial Services Conference taking place in Hamburg is a forum for banks, financial service providers, consumer associations, debt advice agencies, acade­mia, the media and policy makers to discuss current national and international issues affecting consumers of financial services. Against the background of the 10 anniversary of the financial crisis, participants will discuss the situation including the effectiveness of regulation, the prerequisites for sustainable finance and the potential threat of a normalization of interest rates. Other main topics are old-age provision, the situation of financially vulnerable consumers and FinTech. A discussion of Udo Reifner’s Festschrift complements the program. More than 40 friends and colleagues of Udo Reifner have dedicated a special kind of Festschrift to his 70th birthday. The Festschrift is an interactive blog at https://www.iff-hamburg.de/udo-reifner-festschrift/ with contributions that respond directly to ideas and concepts published by Reifner since 1976. Participants of this panel presided by Prof. Doris Neuberger (economics) and Prof. Eva Kocher (law) are Geraint Howells, Dean of the law faculty of the City University Hongkong, Klaus Tonner, University of Rostock, Peter Rott, Editor of Consumer and Law, John Taylor, legal activist against poverty in America and president of the National Community Reinvestment Coalition, Thomas Wilhelmsson, President of the University of Helsinki, Christian Joerges, Hertie School of Government.